At an early age Joseph Brodsky experienced much of what it means to be an exile in one’s own country. Born Iosif Alexandrovich Brodsky in 1940 in St. Petersburg (later renamed Leningrad), he grew up in poverty after his father lost a ranking position in the Russian Navy due to a surge in anti-Semitism against Jewish Russian families in the postwar years leading up to Stalin’s death in 1953. Brodksy quit school as a teenager and embarked on his own self-styled education, beginning to develop the cultural imagery that would eventually win him the 1987 Nobel Prize for literature. Dodging many of the very real barriers of his time and place, Brodsky grasped intently for something different, working odd jobs—including as a coroner’s assistant, metalworker, and as part of a geology research team traveling to Central Asia—all while assembling an unusual arsenal of artistic skills. Brodsky taught himself Polish, for example, in order to translate poet and dissident Czesław Miłosz (a Nobel laureate who also became a US citizen), and learned English so he could translate John Donne and read Herman Melville and Emily Dickinson. Out of the prejudice and censorship surrounding him, Brodsky fashioned a unique style of direct observation and an unflappable belief in individual freedom and what he called the importance of “world culture,” a phrase borrowed from Russian essayist and poet Osip Mandelstam (1891–1938), a touchstone figure for the young artist. Indeed, Brodsky’s idiosyncratic style is one that evaded authorities for some time due to its unusual bearings. As Brodsky writes in the title essay of his collection and intellectual autobiography Less Than One, he was part of a group of young artists and thinkers imagining something new beyond the strictures of Soviet life: “If we made ethical choices, they were based not so much on immediate reality as on moral standards derived from fiction…. In its ethics, this generation was among the most bookish in the history of Russia, and thank God for that. A relationship could have been broken for good over a preference for Hemingway over Faulkner.” This “uncommon visage,” as Brodsky would later come to term his imagining of an ethics based in aesthetics, is exactly what guided the poetry he wrote and distributed as a young man, a form of underground literature printed on mimeographed sheets (called “samizdat” to describe the censored DIY publications of the Soviet bloc era) and often recited by Brodsky and others on street corners. Judge: What is your profession? Judge: Who has recognized you as a poet? Who has enrolled you in the ranks of poets? Brodsky: No one. Who enrolled me in the ranks of the human race? Due largely to coordinated efforts on the behalf of Brodsky via an international network of writers—including notably the New York–based English poet W.H. Auden, an adopted American citizen as well—Brodsky was released from his five-year prison sentence early after 18 months and allowed to return to Leningrad. Harassed continually upon returning, Brodsky was encouraged to leave for Israel, which he refused to do, before being forcibly exiled from the Soviet Union at the age of 32 to Austria where he met with Auden and was eventually received as an immigrant to the United States. Brodsky would eventually translate much of his own poetry from Russian into English, and he increasingly wrote prose in an adopted, inimitable English. As American poet Mark Strand once put it regarding Brodsky’s full embrace of the English lexicon, “The English he writes is exotic. The choices of words he makes are those that no native-born speaker would make.” Reinscribing and revitalizing language as many American innovators before and after have done, Brodsky’s English is both arresting and nervy, a remix of styles that is formal in flourish yet fresh in its oddity. Taken from the poem A Part of Speech, written shortly after coming to the States in 1972, the excerpt above echoes a primary theme in what would come to characterize Brodsky’s mature work, namely the repeated acknowledgment of the responsibility in the “spoken part” of protecting individual artistic expression and freedom, a part that Brodsky identifies with the agency and urgency of protecting the place where art is encountered, where “a work of art addresses a man tête-à-tête, entering with him into direct—free of any go-betweens—relations.” What gets left is a part, Brodsky implores, a part to play in protecting the space of direct artistic encounter. Now on view at the Walker, the exhibition Less Than One takes its title from a 1986 collection of essays that would help Brodsky win the Nobel Prize for Literature the following year. A poetic meditation on the nature of human existence and artistic expression, his text suggests that a person—defined in political and aesthetic terms—is always “less than one.” We can never be a discrete whole at any moment in time, Brodsky argues, as we are inextricably tied to our past and future selves. This drives the writer and artist to attempt to meet reality through words, images, and an uneasy embrace of artistic personae. Brodsky wrote passionately throughout his career of art’s ability to trouble consent, question power, and disrupt the “heralds of historical necessity,” arguing instead for a “polyphony” and multivocal resonance that exists in the place “where art has stepped.” Exploring such themes as iconoclasm, the graphic use of silhouette and shadow forms, and the questioning of identity through performance, Less Than One celebrates the differential urge and unruly spirit that lies at the heart of artistic practice. The uncommon visage that can result within the space of direct artistic encounter, “free of any go-betweens,” as Brodsky put it, introduces what American philosopher William James described as the positivity of many-sided perception, not unlike a boulder or gem. Elongating perception into a shape that is sensed as duration suspended, the “direct relations” of artistic encounter are not unlike experiencing time with a friend, when you lose track of time. When Jasper Johns wrote the following note in his sketchbook in 1964, he underscored a pragmatic method that placed repetition and a startled awake active perception at the heart of his practice, and that resonates to this day: “Take an object / Do something to it / Do something else to it. [Repeat. ]” Breaking away from the dominant painterly mode of the 1950s that consisted of highly personal and expressive abstraction, Johns looked to “things the mind already knows,” incorporating flags, targets, numbers, and other familiar signs and symbols into his artistic production. These ordinary objects take on an iconic, emblematic presence that articulates a particular type of postwar American iconoclasm—represented here by the various doubled, inverted, and multi-colored flags on view in Less Than One. 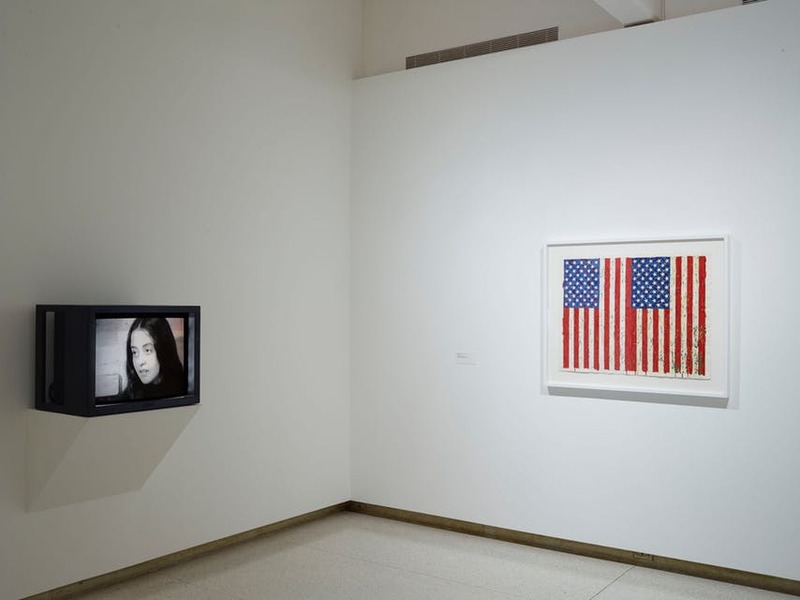 The initial encounter with Flags, 1965, at the entry to the exhibition is one of immediate recognition coupled with a companion estrangement, the familiar design of the American flag outlined in green, black, and orange (top), and gradations of grey (bottom) against a mottled grey background, with a white dot centered above and a black dot bullseye below. As an exercise in visual perception, Flags asks the viewer to focus on the dot above for a time, then close one’s eye briefly and switch focus to the dot below, activating a red, white, and blue afterimage as our retinal receptors tire from holding the initial impression and seek out a fuller range of the color spectrum triggered. Looking at Flags is an exercise in active perception where one must submit to a time beyond the clock, beyond constantly updated information, beyond the flatness of visual compression and image production, beyond ever widening abstractions of finance, beyond the atomizing nature of networked communication, and, also, beyond the rhetorical demagoguery of our moment. It is rather an opening to the active looking and “uncommon visage” that Brodsky adopts, into “direct relations” with the cultural imaginary of becoming American.